It’s time to come out of the cocoon I’ve wrapped myself in since tree planting season ended. Last month was Tu’B Shevat, the birthday of trees. I also feel that it’s the start of a new year for the Susie Forest. I went back and looked at the resolutions I made last year and actually worked on on one of them. I swallowed my fears, picked up the pen and wrote on the wonderful tree quilt that a friend gave me. I’ve decided to record the trees that are planted just for Susie and so the Japanese Maple in Spokane’s Japanese Garden is the first entry. I didn’t smudge the ink or misspell anything – go for number 2, Nancy! Now I know what the Susie Forest tree at the French chateau looks like in the ground. 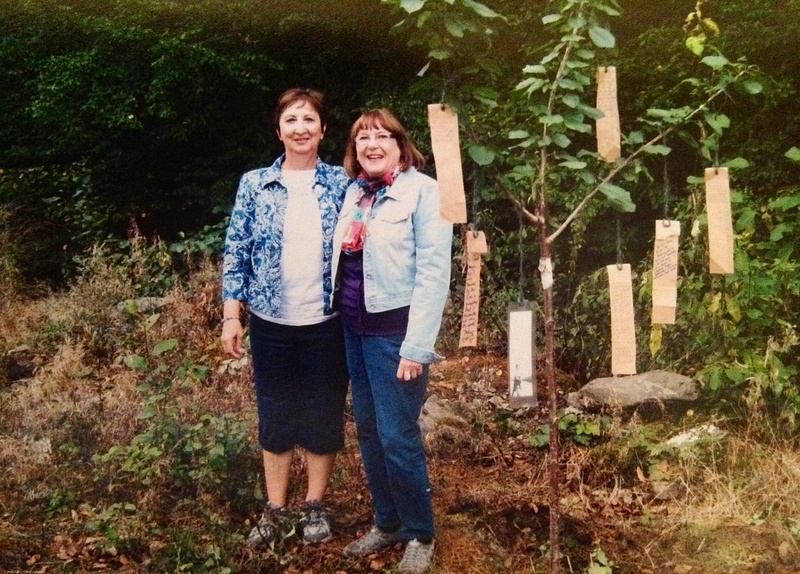 Two fellow travelers (boy, that doesn’t sound good but it was), Valerie and Sandy, went to see the little cherry tree before they left for Paris. It was planted after I left for the Brussels airport in the dark early that morning. The tree-grams were written the night before and thank you to those who went out to hang them. It’s time to write a blog. And here I sit in the perfect place to write it. 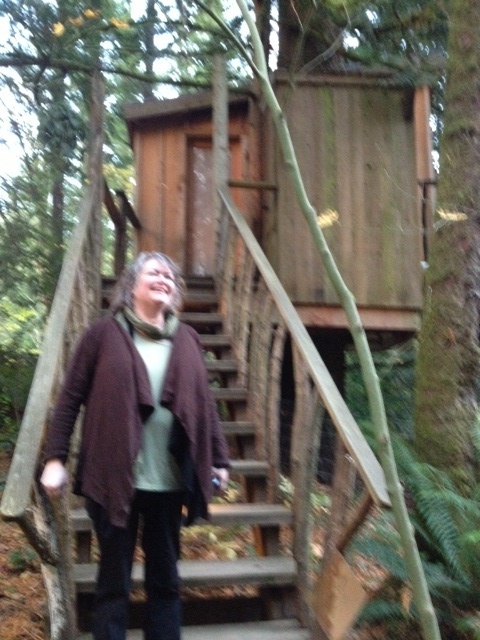 I’m in a tree house! It’s mother-daughter weekend for Becky and me and we came here to Treehouse Point for a fun night in a teeny-tiny tree house. I come over to Seattle to the Bicycle Alliance auction on a Saturday night in November and then we play on Sunday and Monday. One year we went to Victoria to visit a Susie tree and another we explored Bellingham. 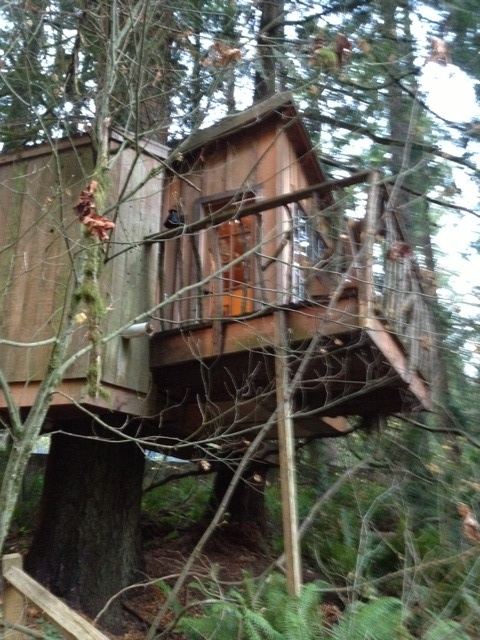 After enjoying Treehouse Masters on TV, I looked up their website and found they had a bed-and-breakfast. I quick called Becky, “We’re forgetting our other plans and going to stay in a tree house!” So here we are about to have some hot chocolate before bed. Of course I came with an agenda. I’d hoped to meet a family member and present my idea, but they were off filming a show. So I talked to a staff member and hope he will pass on my tree enthusiasm. I suggested that at every tree house completion their company plant a future tree house tree somewhere in the vicinity. Naturally I would count them as Susie Forest trees. Ten years ago I stood in front of Witter Pool, so excited to be planting a tree in Susie’s name, a tree to honor my stillborn grandson Steven Michael Miller. There were city officials, state officials, a biking club, a walking club, family, and tv cameras. 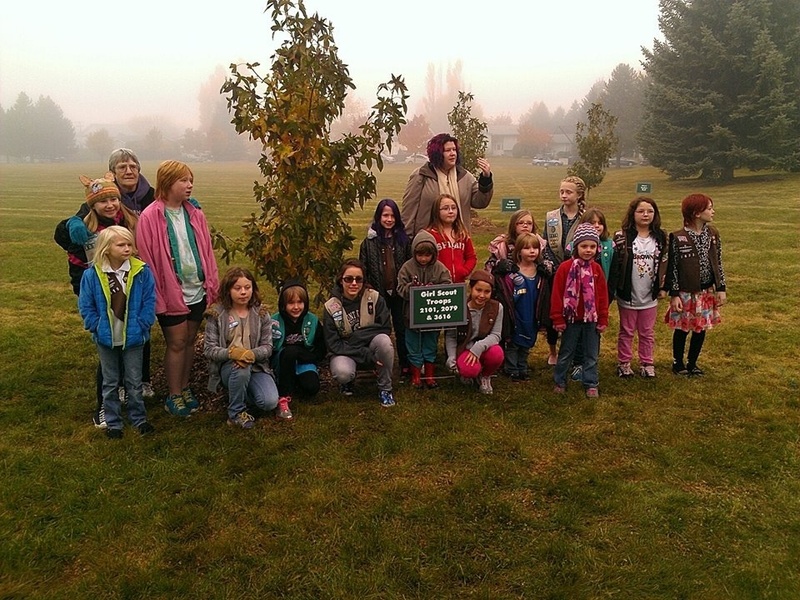 We were bringing the importance of street trees to the public. It was a wonderful day even though I botched the tv interview and it was barely mentioned on the news that night. We planted the Tupelo and off we all went. No one thought about other trees except me. 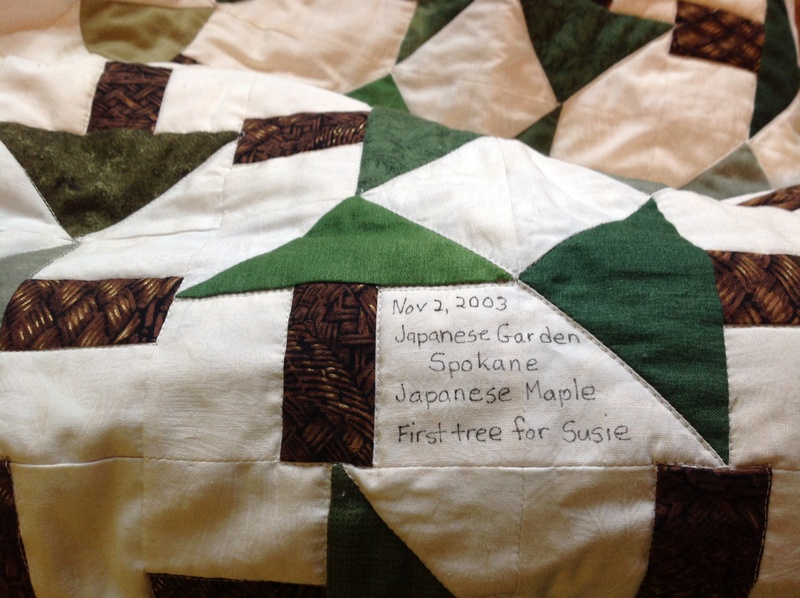 I was thinking about the tree that inspired me – the maple that would be planted in the Japanese Garden and the tree in Shadle Park for Susie’s friends’ stillborn, Grace Susie Bain. I thought about those trees and the plaque these trees earned for Susie in City Hall. I thought that would be my plantings for Susie. 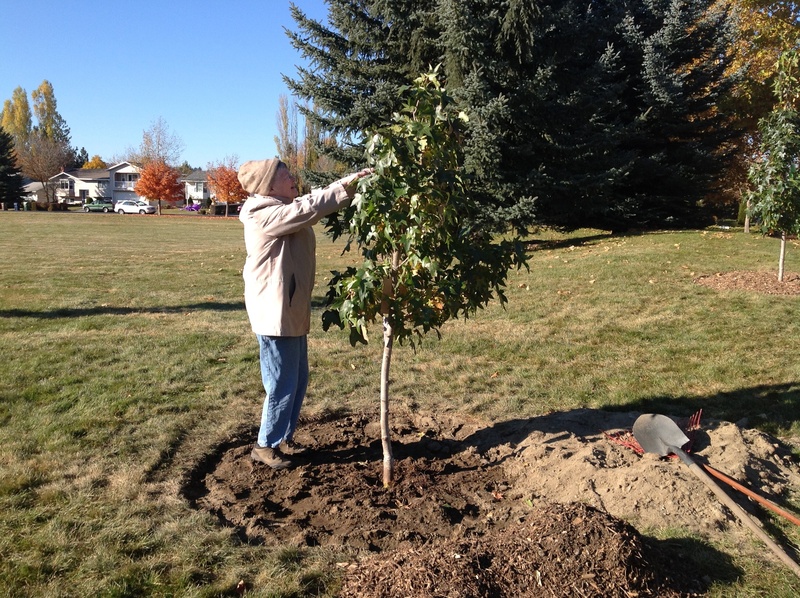 This week, on the anniversary of that planting, I stood in Friendship Park beside Spokane’s 251st tree. (And there are three groves in the city, too.) It was a small group, the city arborist, a curious citizen who wanted to see what this was all about, a member of the Ponderosa Society, a library friend, and a woman walking her dog. We finished the planting, added tree-grams, a bookmark, a tree identification tag to the branches and stone by the roots. Then we ate our cookies. So much has changed in ten years. 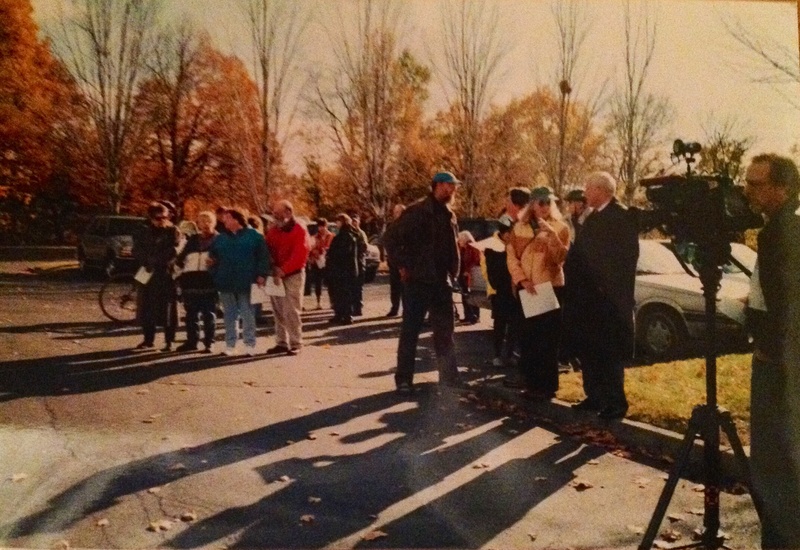 – a real dedication ceremony for the people who “own” the tree. There are no longer just three trees, there is a Susie Forest. So what will happen in the next ten years? 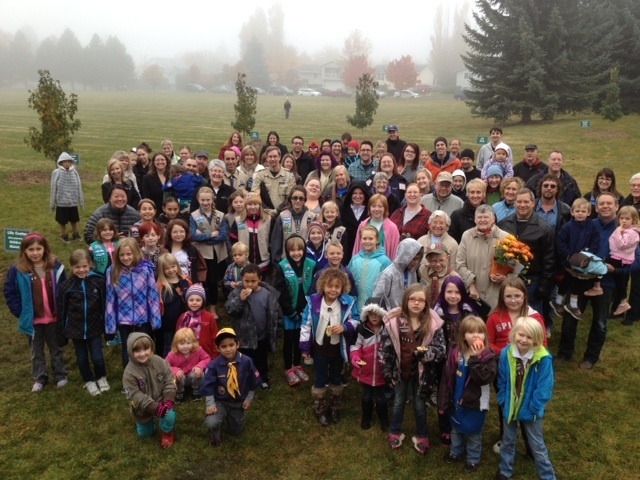 Can we more than double those 251 trees in Spokane? Can we go from almost 400 trees around the world to more than a thousand? Let’s make it happen! 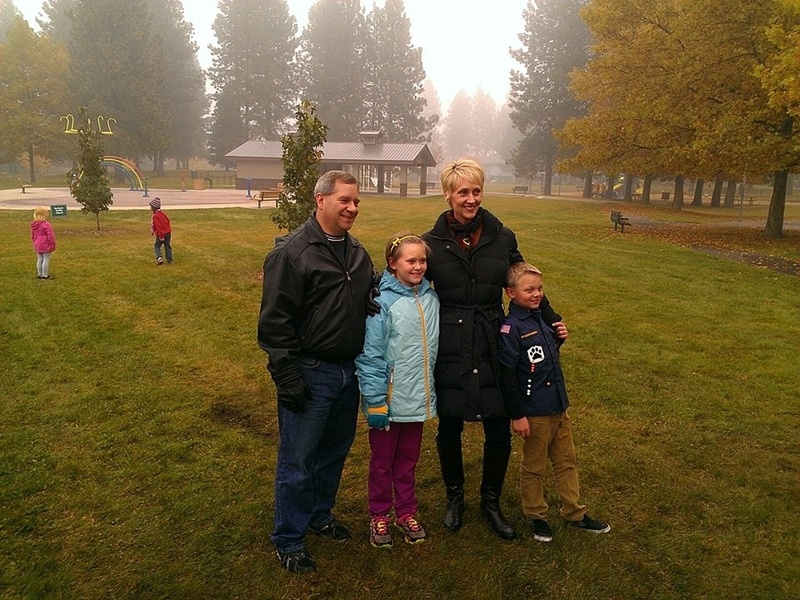 Holly’s dream park was dedicated in the fog this morning. It was another one of those days that make you wonder if people will look out their windows and decide to stay home. Would anyone come? They did! Would the dedication of nine trees for nine different groups work? It did! 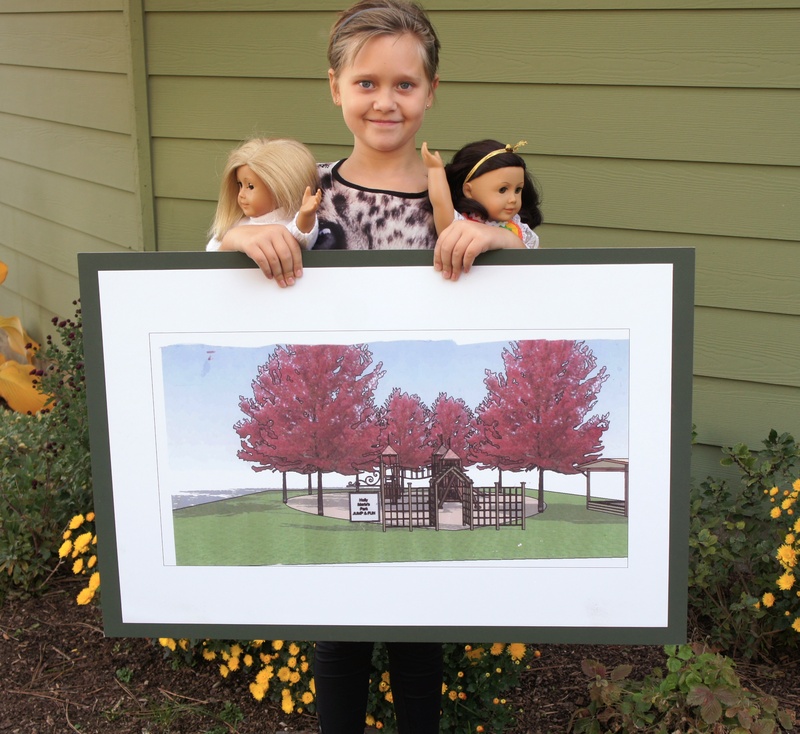 Holly and her family told the story of her plan and her work to get those trees planted. Then she introduced me to tell how the Susie Forest got involved. After a photo shoot every group went to their tree and began hanging their tree-grams and in the case of the Cub Scouts, doing a little digging. There were pictures being taken and children running from tree to tree and people running into old friends. I got so into it all that I forgot some things like putting out the stones and passing out the tree books that I picked up at the library bookstore. I did manage to do it all even as people were leaving. What a great experience this was for me. Especially since I met a little girl who may grow up to be another Susie. After the location for Holly’s heart was decided on, the planning for the occasion began. There are going to be ten trees and of course, one will be for Holly and one for Susie. But who should the other eight trees belong to? For several years I had been collecting names of children’s groups that maybe I should plant trees for and now I had a place for some of them. I got together with Holly’s family and told them my idea and how it would be a chance for Holly and me to talk to the children about having a dream and working hard to make it happen. They liked the idea and began a list of their own. Soon Holly and I were on our speaking tour. 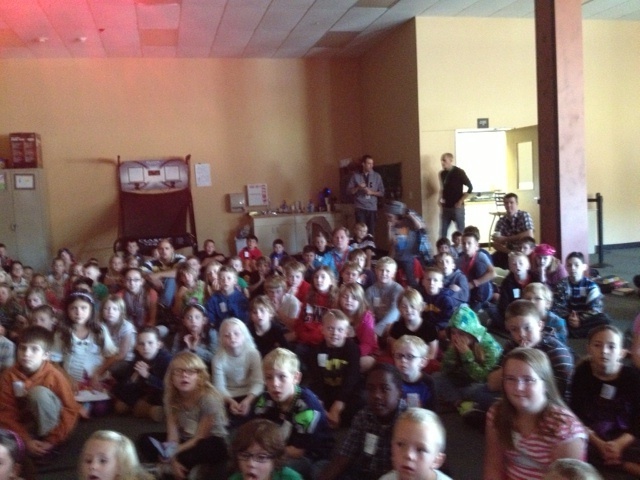 We presented in front of Scout groups and church groups and classrooms. Each group was given a kit with tree-grams and bookmarks and told about their tree. 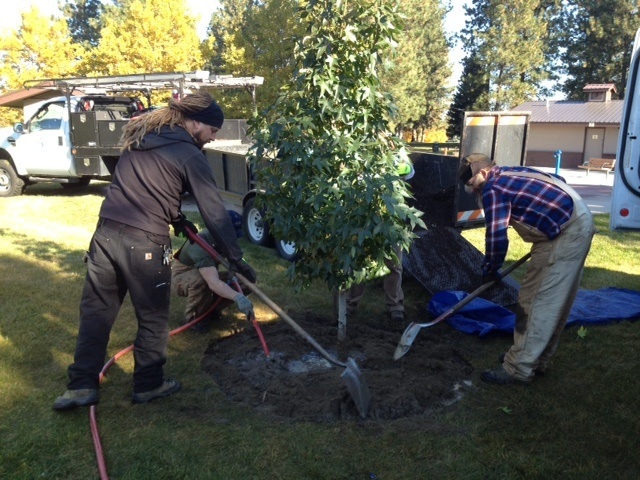 Tomorrow they will come to Friendship Park and help finish up the planting of their trees. Here are the groups that will have a tree: Girl Scouts, Cub Scouts, Holly’s Sunday school at Life Center Church, her fourth grade class at Hutton School, Vanessa Behan Crisis Nursery, the Guild School, Big Brothers/Big Sisters, and Anna Ogden Hall/Union Gospel Mission. I hope there will be lots of children there tomorrow to eat all the cookies I baked. And there it also stopped while we figured out where to plant these trees. Where was there room? Where could they be seen and appreciated? The grown ups thought it should be on a slope and we spent a lot of time looking for a bare slope in a park. We showed it to Holly and she said, “No, that’s weird.” She wanted it by a playground. So we started looking again. And then Holly’s dream and mine came together because I wanted a big event to celebrate the tenth anniversary of the Susie Forest. 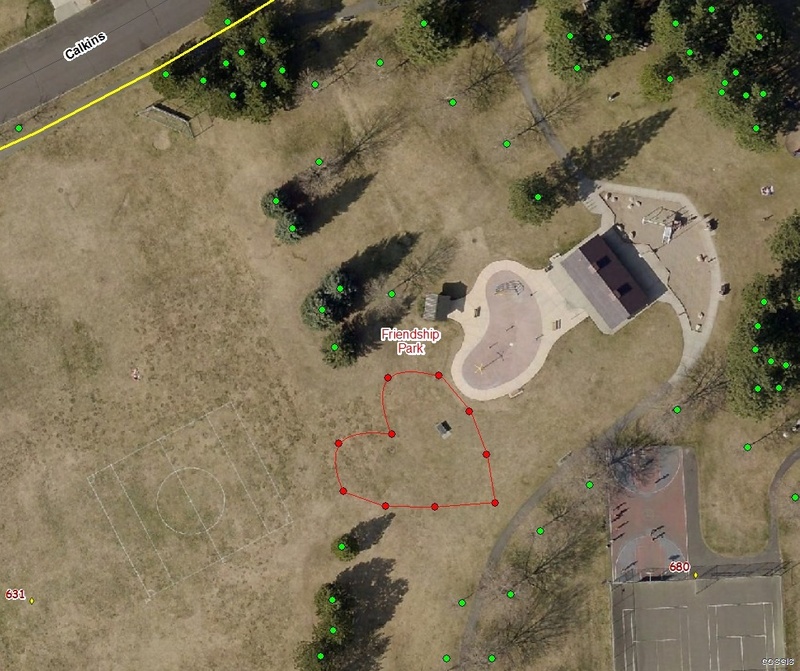 What a perfect event – planting ten trees in a heart shape next to the splash pad in Friendship Park. So on Saturday at 10:00 our dreams come true together. The first seven trees went in on Monday and two will be planted on Saturday and the last on Tuesday the anniversary of the first planting.